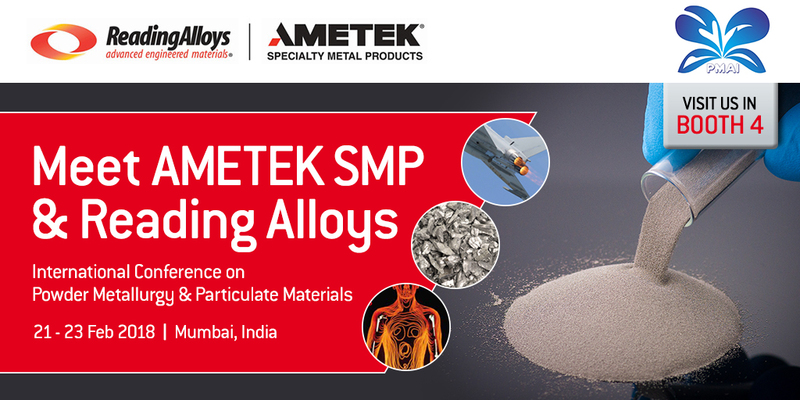 Reading Alloys and AMETEK SMP Eighty Four, both part of AMETEK Specialty Metal Products (SMP) and based in Pennsylvania, USA, will be exhibiting at the International Conference on Powder Metallurgy & Particulate Materials from 21st to 23rd February. Organised by the Powder Metallurgy Association of India, the event is being held at the CIDCO Exhibition Centre in Mumbai and is expected to attract a worldwide audience from the Powder Metallurgy industry. For the two AMETEK businesses, this high level event represents an excellent opportunity to promote their industry-leading expertise in manufacturing atomized high-alloy powders and high purity titanium powders. AMETEK SMP Eighty Four will be highlighting its global leadership position in the production of water atomized high-alloy powders for critical applications that demand the highest temperature and corrosion resistance. The business specializes in manufacturing advanced stainless steel powders, made to exacting customer specifications for automotive parts, fibre cutting/textile industry, porous metal filtration and thermal spray. Reading Alloys produces gas atomized powders used in thermal spray, brazing, metal additive manufacturing and metal injection molding applications. Titanium powders complete the product offering, custom-made via the Hydride-Dehydride (HDH) process for critical medical and electronic applications. A noticeable market trend for the growing demand for higher performance customized alloy powders matches the expertise of both businesses. This is particularly evident in the automotive industry where high-performance engine components such as turbo chargers require higher temperature resistance materials. Growth in the Indian market has led AMETEK SMP Eighty Four to invest substantially in the country and it now has, together with Reading Alloys, a dedicated local AMETEK SMP representative there, Rahul Gujar.